Ouch! No college teacher is going to die because they don’t self-publish. What an overstatement! Luckily, the pressure in academia to publish research does not extend to college ESL teachers like me, so why use such a provocative title? Because self-publishing keeps you engaged in the best parts of teaching. Also, teachers who are not fully engaged in teaching ESL might not last in the job. With the teacher shortage we are facing in Quebec, we want teachers to persist. We also want teachers to excel, and self-publishing could be the way to help make that happen. Of course, all teachers adapt materials, create activities, and design evaluations. We are all involved in materials development to some extent. Slapping a cover (or a URL) on your best ideas and getting them out into the world for other teachers to use–and give you feedback on–is the next logical step. keeps you engaged in your job. gets you thinking about the precise needs of the students in front of you that the big publishing houses miss. gives you something to talk with your colleagues about other than administrative rules and office gossip. helps you articulate your pedagogical ideas more clearly. makes you more self-conscious about the quality of your lessons and activities. invites constructive criticism from teachers who try your lessons and activities. I have been developing ESL textbook materials for publication since 2004, I have been working on this grammar checker website since 2012, and trying to express my ideas in this blog more recently. My friend Frank Bonkowski has been at it for many more years. 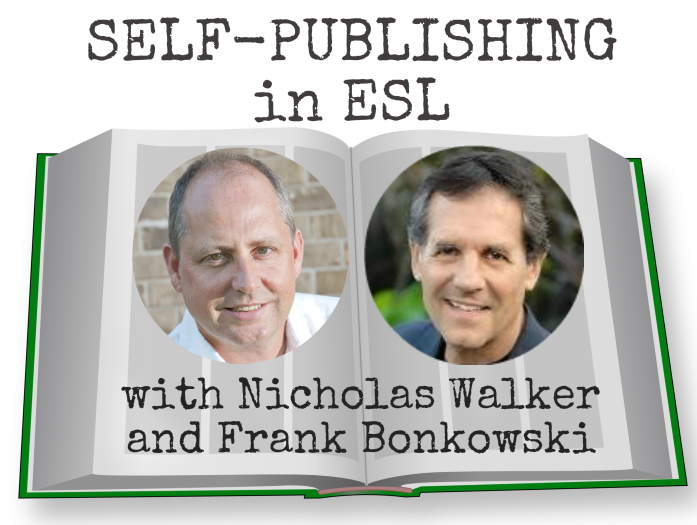 While discussing the positive effects of self-publishing as a form of professional development to supercharge ESL lessons, Frank suggested we do a conference talk on the topic. After all, in the past 2 years I have won 3 awards, and Frank has been called upon to give teacher training to American in-service teachers at a distance. We seem to have acquired some expertise in our field over the years. So, we sent off proposals for two related talks at two up-coming conferences. Both proposals were accepted! That’s right. We will be presenting some practical advice at the RASCALS Colloquium in Rimouski in June to ESL teachers teaching at colleges across Quebec. Two months later in August, we will be sharing our ideas on the topic again at LangFest 2019 with an audience of polyglots, translators, and second language teachers (not just English) teaching in a variety of contexts. In the lead up to LangFest 2019, we agreed to an interview to introduce ourselves to conference goers. Frank and I have just finished that video call with Tetsu Yung and Nicolas (last name unknown), two of the organizers of LangFast 2019. The goal of the interview was to help conference goers get to know us before our talk in August. Who are we, you ask? Frank Bonkowski is a College ESL teacher at CEGEP de St Laurent, teacher-trainer, and materials developer. You know who I am. We are thrilled to have been invited to speak on a topic that is so important in ESL: self-publishing. Self-publishing means creating and distributing your own materials, on paper, online or a blend of textbooks and companion websites. For Frank it is a labour or love. For me, it is the only way I can bear to teach ESL year after year. I need the stimulation, innovation, and inspiration self-publishing provides me. Without it, I would have given up on ESL teaching years ago in frustration. Hello everybody. It’s Friday again. We have today Frank how do I pronounce your name? Bong-koff-ski? Is this correct? And then we have Nicholas Walker. These are English teachers I don’t I don’t remember if we have had English teachers before but specialists in teaching English which is a very important topic at Langfest, so welcome to YouTube. Thank you for taking the time to come on our show. Thank you. It’s a pleasure to be with you and thank you for having us giving us this opportunity. Yeah, thanks for having us. We’re excited to participate in your conference and we’re thrilled to be able to talk about our topic which I think is so important to our field. So, Nicholas why don’t we start with you with you and get to know your your involvement in the language world what do you do you know what occupies your time.